Station W0EQO, which has operated from Camp Courage North since 2009, is set to go off the air in early August 2015. The station has been in almost continuous operation from Summer 2009 though today, summer and winter, through broiling hot days and subzero cold of our bone-chilling Minnesota winters, all in an unheated and uncooled attic IT closet at the residential camp. When you think about the rig control PC running that long under such difficult conditions, you have to wonder how it didn’t just give up the ghost! Of course there were outages, some minor when the power or internet dropped, others longer when there was a networking problem to be solved. Most everything eventually got fixed by volunteers like Lyle, K0LR, and Bill, N0CIC. We are so grateful for their help in keeping this resource available to our members over the years. The station may be going off the air for now, but it will come back again with a new host computer and a better location. We will take it off the air in early August, transporting it to the Twin Cities for rehabilitation and a new host computer. While we are working on the station, it will be set up with new hosting software from www.remotehams.com. It will be much more reliable with new hardware and software and will no longer require Skype for the audio. We are grateful to Stan, W4MQ, for the use of his software over the years. Following the decommission of W0EQO, we will no longer support or offer the W4MQ software at this website. The new stations will use the Remotehams.com RCFORB software. We will provide news updates on this site. I hope you enjoyed operating during the June ARRL Field Day event. Our local club members had a great time of operating, fellowship, and food. We even had a Friday night potluck dinner to congratulate everyone who had spent time that day setting up and to share a wonderful meal together. After all, isn’t community one of the most important aspects of amateur radio? Take a look through this month’s events information. I’m sure there will be some events that catch your eye. Support your local hamfests. There are two hamfests that have been highlighted in the events this month. If you’re not able to attend either or both of these hamfests, checkout some that may be happening near you. Hamfests are a great way to meet local hams, get some bargains, and continue to support a great hobby. For an extensive list of contests that will take place in July, you should check out the following URL: http://www.hornucopia.com/contestcal/. Jul 11, 1400Z-2200Z, W9L, Ashland, WI. Clarence Campbell, N9XIM. 14.270 7.270. Certificate. Clarence Campbell, 1014 Chapple Ave, Ashland, WI 54806. Special Event celebrating the centennial of the Ashland (WI) Harbor Breakwater Light on Lake Superior. This special event station is part of the centennial celebration of the light sponsored by the Ashland Historical Society. Certificate: $2. Card: SASE. Please, no e-QSLs. Jul 24-Jul 25, 0000Z-1800Z, N5M, Oklahoma City, OK. Central Oklahoma Radio Amateurs. 14.266. QSL. Sam Sitton, W5CU, PO Box 48, Edmond, OK 73083. W4MQ software will be replaced! A screenshot of the RCFORB client software controlling an Icom IC-7200. The Remotehams.com RCFORB client is in use at the WA0TDA HF remote base. We think that this client is screenreader accessible and would like to hear feedback from blind users. So far I have been delighted with this method of controlling remote base HF radios around the world. The software does speak the frequency readout and control settings for blind users, a feature available in the settings. The nifty thing is that once you set up your preferences in the settings, it applies across all of the radios available around the world. For example, if I want to ask my IC-7200 what frequency it is on, all I have to do is the keystroke combo ALT-SHIFT-F. Later that day I decide to listen on a Flex radio in Alabama. I use the same keystroke to ask the Flex to tell me the frequency. This is really nice because once I learn the RCFORB software, the commands are pretty much universal across radios, subject to the radio’s features. Remember that the radio does not need to have a special speech chip installed because the voice frequency announcements are done in the RCFORB software, not the radio’s hardware. The procedure for getting the RCFORB software set up is a bit different than what you are used to with remote base operation. Your first step is to go to the website Remotehams.com and read about the system, which provides access to many stations around the world as a volunteer effort. The RCFORB software is free and works on Windows computers. You can support the project with a donation if you wish. You should set up a free account. Uploading a copy of your license is highly recommended if you expect to request transmit privileges on any of the remotes. It appears to be more blind accessible. It is under current development. It supports physical hardware devices on the client side, like K3 transceivers and a neat little hardware box into which you can plug a microphone and key, though it can also be operated from a computer or Windows tablet without these extra devices. There is a great Android app that allows you to control radios from your smartphone. 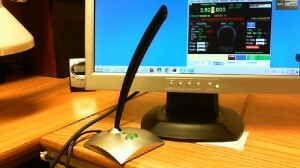 It’s under $10 and works well for me, though I have not tested it with the Android screenreader. You don’t need a third-party audio application like Skype since it has its own built in audio. Multiple users can listen at the same time without resorting to Echolink. The RCFORB client allows for a number of listeners with one control op at a time. From an administration standpoint, the host software for this system is much easier to manage. If someone wants to use my station, all I need to do is check my list for transmit requests and check the uploaded licenses for verification. I can then add the user to the list of those who have transmit permission. Although I did have to open several ports on my router to the host computer, this is not necessary for the actual users of the station, so the client software is very easy to set up. No fiddling with your router’s ports! Finally, once you set up the RCFORB software there is access to many stations. You don’t have to worry about setting a special IP address for each station as you do with the W4MQ software. This makes it much easier to use many different stations, a definite advantage as band conditions change from one geographic area to another. On the hosting side, those of us who set up the stations for others are usually already very busy with our own projects, our jobs and families, and everything else that needs doing around the house. Maintenance of W0ZSW and W0EQO as it is now with the existing software is really, really time-consuming. There is a lot that needs to be done by the system administrators. Nothing is automated and each host computer needs separate maintenance, including for simple things like requested password changes. Software crashes are getting more common. It is time for a reliable, updated rig control system. That is why we need to get your feedback! Please consider testing the Remotehams.com system and letting me know what you think about it.